Diane Abbott today appeared to leave the door open to Labour deselections as she said local parties’ inner workings should not be cut across. The shadow home secretary also told Progress conference that Jeremy Corbyn had never called for deselections, as she praised the last Labour government, and said the party leadership is focussed on winning the next election, whenever it comes. “A Labour government, that I may not have always agreed with, transformed the lives of my constituents,” she said. 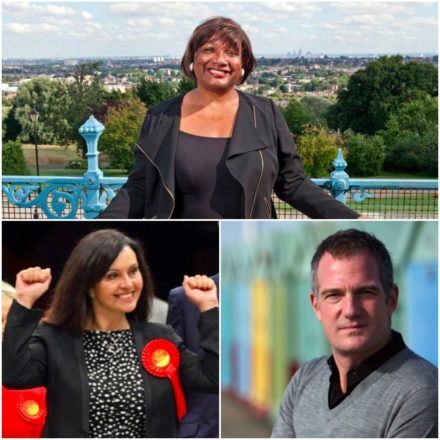 “Some say the left of the party don’t care about winning, this Hackney MP always does”. Abbott was speaking at a panel event called ‘Lots done, lots to be done: How do we bring this Tory government to an end?’. She was there alongside Caroline Flint and Peter Kyle, as well as former YouGov president Peter Kellner, in a session chaired by former special adviser and comedian Ayesha Hazarika. Kyle, the Hove and Portslade MP who received the largest Tory-to-Labour swing in the country, was clear that the party needs to broaden its support base to win in a future election. The fact that many who need the Labour party most aren’t voting for us should be a cause for concern, he said. “Broadening our appeal is not just a convenient strategy, it’s the right thing to do,” he said. Abbott agreed with the importance of supporting people elsewhere in further education and said that young people in Hackney were more effected by the changes to EMA allowance. Kellner, the only non-politician on the panel, suggested that the Labour manifesto had been disingenuous for suggesting that any Brexit deal could leave Britain in a better state. He remains an ardent Remainer. Flint dismissed any idea that Britain could stay in the EU after the referendum result, describing it as “b******s”. She criticised the remain campaign itself as too metropolitan and middle class. “In the circumstances pretty amazing that more MPs in leave seats did not lose,” she said. The former government minister pointed to the tight results in Ashfield and Bishop Auckland, along with the loss of seats such as Mansfield, as evidence that Labour needs to do more to shore up and build support in Leave seats. She described the election result as the revenge of the Remainers. She asked: “are we now a party of Liberals like the Democrats in the US or a party rooted in the class system?” whilst pointing Labour’s loss of working class voters.